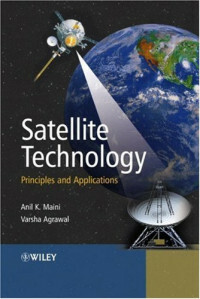 Offering readers a concise and yet comprehensive reference, Satellite Technology provides a unique coverage of both the principles and applications in this wide field. This book covers the technological and application aspects of satellites in one volume, ensuring not only extensive coverage of communications-related applications of satellites, but also other important applications such as remote sensing, weather forecasting, navigation, scientific and military. The essentials of satellite technology are explained, by giving an introduction to the fundamental topics such as orbits and trajectories, launch and in-orbit operations before going on to describe satellite hardware, communication techniques, multiple access techniques and link design. Topics range from the history and evolution of satellites, and the laws governing motion of artificial satellites around earth, to multiplexing techniques, satellite subsystems and link design fundamentals. The coverage of satellite technology together with its applications make the book an essential reference book for professionals, R&D scientists and engineers and students at undergraduate and postgraduate level.